Do you know what gives a song that distinctive pop? The snare! It’s what ties everything together and makes a song whole. 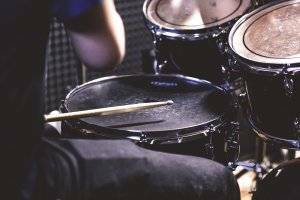 If you buy a drum set, it usually comes with a factory snare that is okay – but nothing a real drummer wants to be involved with. Plus: the snare drum is involved in almost every groove and pattern that you’ll ever play. 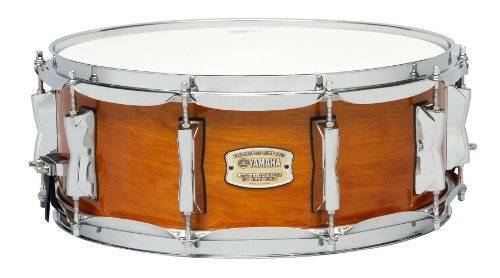 So a bad snare will continuously annoy you, while the best snare drum for your needs will make each rhythm sound even more pleasing to your ear. This is why I’ll show you what to look for in a snare drum and give you my take on which model currently for the best snare drum on the market in 2017. This way you will be cracking rim shots, drum fills and everything else much more passionately! Questions, Comments, or a “Snare to Share”? Nor particularly sensitive, needs a good pounding to really wake it up. Yamaha has received significant acclaim for its Yamaha Stage series and this redesigned snare is living up to this reputation. Yamaha has made some significant upgrades to these shells with thicker ply and more rounded edges (remember, rigidity and material). The hardware is all made of high quality and it is ideal for all skill levels. Not well-suited for long gigs. Need to be tuned up somewhat frequently. 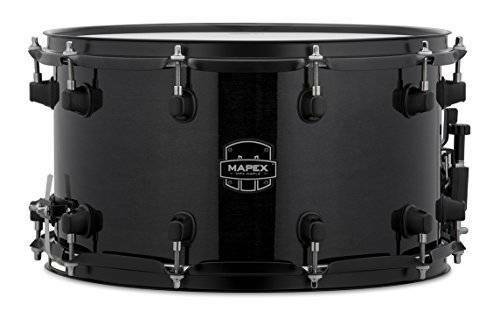 The black finish on the Mapex MPX 14 x 8″ is seriously cool. Their newest release comes with a wide variety of options for whatever your needs are. They have eight new models available with steel, maple, or birch shells. They have adjustable, high-qaulity hardware and Remo heads with great sound. 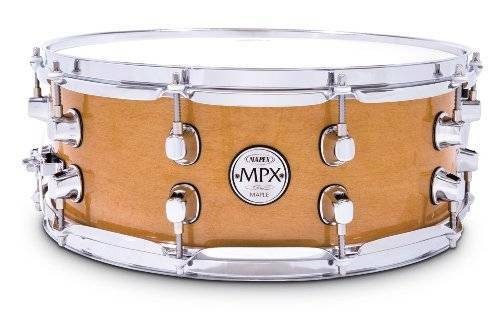 The Mapex MPX 14 x 5.5″ snare is an excellent multipurpose snare. The natural all maple finish gives it a classic look and the size is suitable for all playing styles. It can be used as a concert snare standalone and can also be great in a kit. Pearl is renowned for their quality and the VPX Snare features a 14″ x 5.5″ birch-ply shell for great power and snare crispness. Its Duo-Motion snare strainer provides sensitivity along with smooth switching action, and can convert from a side lever to front-facing “Gladstone” action. This is a solid overall drum that can handle some serious use. 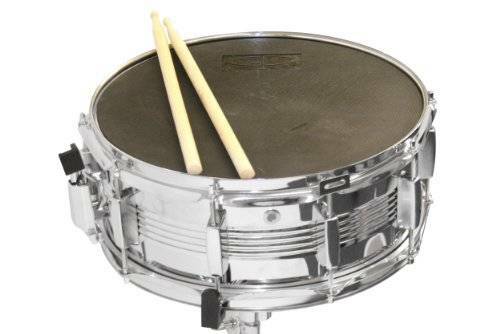 Snare Size: 14″ x 5.5 in. The name really describes it. The GP Percussion SK22 is perfect for students and has everything you need to start playing. This kit features a 14 inch metal-shelled snare drum and a double-braced stand. It also features a rubber practice pad to mute the drum’s sound while your student practices at home! The kit also includes wooden drumsticks and a drum key for tuning. And to top it all off, everything fits in the included padded, nylon backpack with shoulder straps and carry handle. The ADM student snare is a quality student snare drum that comes with a pad case and stands, all in one package. The hairline nickel finish gives the snare a professional look. It produces a resonance and soft sounding tone that is great for jazz, latin, acoustic, and semi-rock style music. For the price, sound, and quality, it is hard to beat the Yamaha Stage Custom Birch . It is well-suited for a range of different styles and holds up to some seriously long jam sessions. It also functions well as a standalone snare, and also as part of a set. 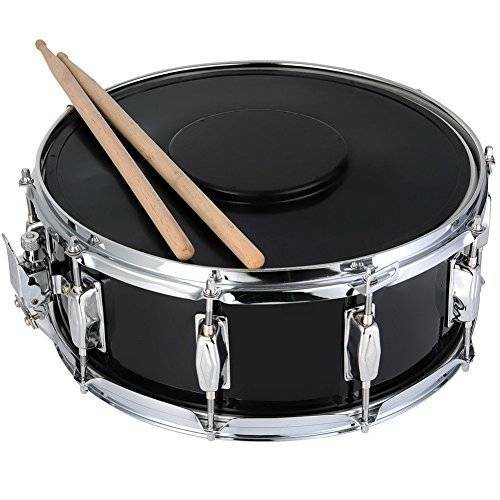 It is a great looking drum that you will be able to get solid use of. The GP Percussion SK22 Complete Student Snare kit is such a great value. It has widespread functionality, bright sound, and can suffer the abuse that new drummers might throw at it. It is a great option for those trying to upgrade a prepackaged set or for those just looking for brighter sound at a good price. Plus, it comes with great accessories that make it super portable and perfect to carry to and from school band practice. Looking through a music instrument catalogue can be a confusing affair. Every brand claims to have the best model and that you can’t go wrong by purchasing theirs. This is where it gets tricky. Is it worth it or not to spend a couple hundred extra dollars? It really depends. As with everything, you are talking about an investment. Knowing a few things will help you figure out which choice is best for you. There are just a few features that you need to be on the look out for. Specifically, these are: rigidity, shell material, and construction. The rigidity of your shell determines the way it projects sound. You are looking for it to be dense and hard. When you are tightening the snare’s hardware, you don’t want the shell to cave in around the edge. A good method when comparing wooden and metal shells is to put them on the floor and push down on them and notice how much they bend. Oftentimes, wooden shells actually are more rigid and stronger than their metal counterparts. Once again, you are back to the question of wood versus metal. This might be where catalogue confusion can hit you. Some manufacturers will talk about rare woods and unique alloys for the best sound. The truth is, the sound is not particularly determined by what the shell is made of. What’s more important is the rigidity, the roundness, and how well everything else is crafted. For these things you are going to probably want a denser wood or metal, but don’t be fooled by anything having “unique sound qualities” from being made from a certain material. Some may have improved structural integrity versus others, but again, a particular material is not always “better” than another. Now, this is an important piece to the puzzle, because the way the shell is constructed will determine how your sound resonates and projects. And you are going to want to balance this with the first two features. When thinking about wood shells, you want to find an equilibrium between minimal thickness with the right rigidity. For example, let’s say you are comparing between 1/4 inch and a 5/16 inch shell. You may get a little more rigidity out of the latter, but that will be at the expense of sensitivity. For this same reason, this is why you may want to avoid shells with reinforcing rings along the inside edges because you lose that sensitivity. Instead, opt for a shell that the manufacturer has twisted before gluing the edges. This increases structural integrity without dulling the sound. Side note: also look for the amount of glue on the snare and check whether the insides have been finished to be protected from weather effects. Usually the more glue, the more dampening occurs. Likewise, you want to make sure your investment is protected from humidity and other environmental influences. 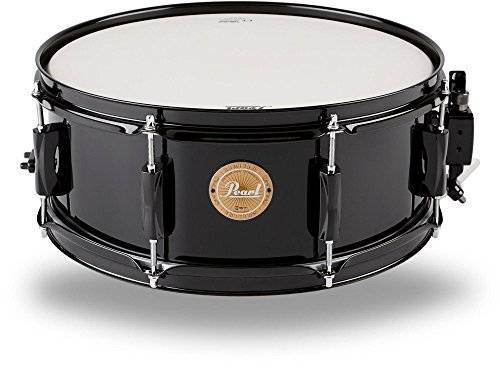 After reviewing countless products including a wide variety of drums (from bongos to djembes, to cymbals), we have made our top five list of the best snare drum on the market. Each of these has unique qualities that make them stand out as excellent choices to match a wide variety of drum sets and personal needs. Not only that, they are all affordable and would make a great addition to any drum set. Try to look out for snares with manufacturer’s warranties. High quality companies like Yamaha and Pearl have some pretty good protection plans that can make sure your investment in sound doesn’t get thrown in the trash can. 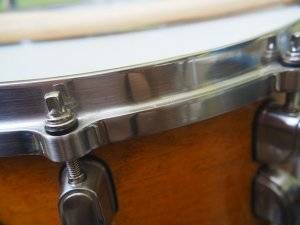 Now that you know what to look for in a snare drum, check out these top picks! Let me know in the comments below! We reply 100% of the time!